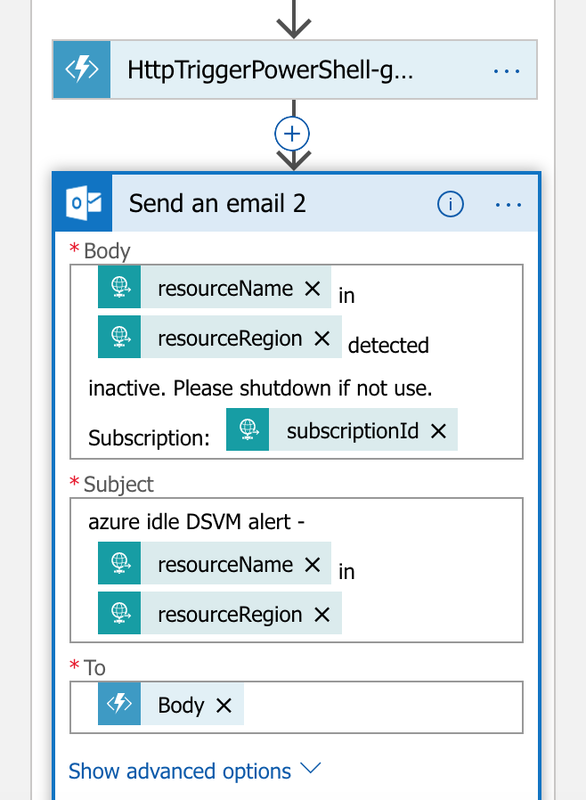 Similar to AWS Lambda, Azure Logic App can be used for automated workflow. However, clear documentation is harder to come by, with fewer working examples, and often lack of effective technical support. In a workflow, it should be a common requirement to pass the output of one step to another step. The motivation to post this working solution, is there is no clear example that illustrates how exactly that is done. It should be learned in a few minutes, rather than hours of trial and error. Using a simple two step workflow to illustrate, in step 1, we use an Azure Function App with a powershell script. 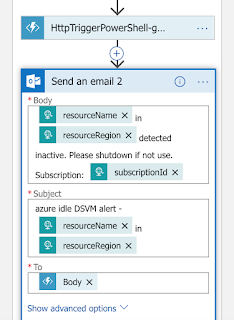 We can obtain a user email dynamically from Azure VM's user defined tag field. Azure recognized a step generates an output, and make it available to be used for subsequent steps. The particular handle is shown as "Body" of Step 1 Function App, again, rather odd representation. But it does work. And this simple mechanism is a much needed building block to construct complex features in a workflow.